A Life without Anorexia: Do you choose or suffer from an eating disorder? Do you choose or suffer from an eating disorder? Well i think this all depends how you choose to look at eating disorders. I dont see an eating disorder as a choice, or a choice to be sick. But an illness... it is something in the head. For me personally there were times when i wanted to eat, times i didnt want to go out running, but somehow i forced myself to do them, not even knowing why. Whether someone wants to call that a choice, self discipline or something else i dont know. But i wouldnt call it a choice. A choice for me is when i choose to eat an apple instead of a pear, not when i purged food from guilt and anxiety. For some people their eating disorder begins with a set of choices i.e maybe they choose to go on a diet that spirals out of control. But suddenly they have no control, its not really them making the choices, but the chemical imbalance (i.e a sort of controlling compulsion & guilt and anxiety in the head) that controls you. There are of course times when someone puts food infront of you and tells you that either you eat or you take the consequences and if you decide to not eat. Then that is an actual choice you make. I dont believe that an eating disorder is a set of bad choicesand its not something you choose unless you are pro-ana/pro-mia. Of course there are choices you make but you have to realise that you arent in your right mind either. Its like when someone who suffers from schizophrenia or bi-polar disorder or anything else and then attacks and kills someone. You could say that its a choice they made, but on the other hand it really isnt. If they are in some sort of phase where they lose their perception of reality and whats right and wrong then they can do things without knowing about it. And its a bit like that with an eating disorder. If i was in a right mind i dont think i would have wanted to jump off a bridge because my mum made me eat dinner. Or that i would cry and have a panic attack in a shop because we were buying full fat yoghrut, not low fat. Those arent things i would do if i was in a right mind. Im not stupid, i know that if i eat an apple i am not suddenly going to gain 2kg. But thats what i thought when i was sick so i didnt want to eat, i was scared of weight gain and being fat. And other fears and thoughts in my head which controlled my behaviour. You shouldnt feel guilty for being sick, that wont help you recover. Its important to admit to yourself that you aactually are sick and struggling. Dont blame yourself for this. Its like if you get cancer, you cant blame yourself for getting it. Its not something you choose. However, if you are someone who has smoked 2 packets of cigarettes a day amongst other things and you end up with lung cancer, well then you cant thihnk " what a coincidence. " Choosing to smoke everyday and knowing the consequences, thats a choice. But with an eating disorder, even if it may feel like you are making a choice - which you are, but there is still a chemical imbalance in your head. It is still a mental disorder. If it were so easy to just eat... then why wouldnt you? Nobody would struggle with an eating disorder because really, you could just make the choice to eat. Why would anyone really want to stay suffering and living in the hell you do when you have an eating disorder if it was just to choose to eat and gain some weight? No... there is alot more to it than that. Your illness might not be a choice (how i see it anyway), but recovery IS a choice. Its something you have to choose everyday until you no longer suffer from your ED. 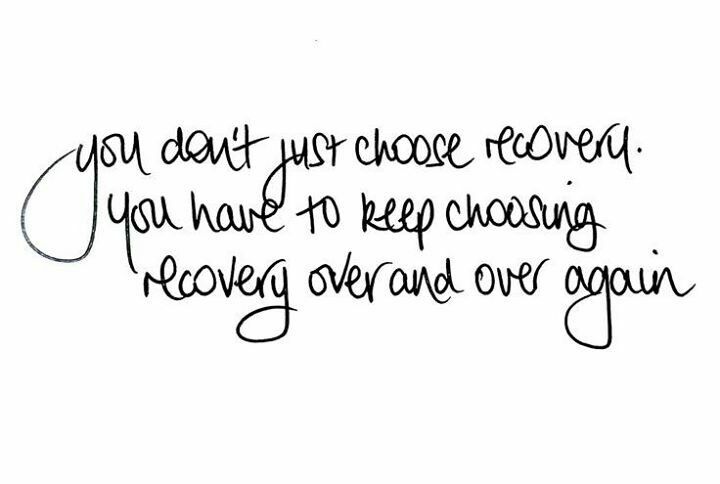 By actually making an effort and a choice to eat every meal then you are consciously choosing recovery! Also know that some people are more prone to develop an eating disorder due to genes or other things, and all it takes is a catalyst (such as a stressful event, tragic loss, strong emotions etc) to set things off. The body is pretty darn smart, reason why normal people get hungry after x hours and know it's time for them to eat. Do they count calories ? No. The body is speaking. But when I got in this "starvation mode" I sincerely wouldn't feel anything even similar to hunger. And this total suppression of innate feelings isn't normal. We can't consciously fight instincts and that sort of things.The fight is actually happening at a subconscious level. When I understood that I had to accept the possibility of the whole thing being more then "simply a desire to be thinner", in other words, an illness. Lots of people decide to go on diets, did they all become anorexic skinny because of that ? No, because if you're not sick, your body reacts and you end up yo-yo dieting. Sorry it got so long ^^ it's just something I've been struggling a lot myself and it's only after realising certain things and accepting to let it go and go forward - making up for what I've done instead of regretting - that recovery really became a little easier day after day. As Izzy said, recovery is THE choice, and it's the best one you can gift yourself with. Best wishes. -C.
Anorexia is a biologically based mental illness, brought on by a combination of genetics, life circumstances, personality traits and for some people, a predisposition to mental illness such as OCD, phobias, anxiety and depression. It is often used to replace feelings of low self esteem, loneliness and lack of life 'control'. IT IS NOT A CHOICE. If you have an eating disorder, usually something else is going on for you mentally at the same time even if you can't see it. It is about learning to change your thoughts and behaviours as well as your physical health. I don't think you chose to have an eating disorder. Its easy to think that your ED is a part of your identity, it feels like you are your eating disorder because you're the one restricting/binging/purging/overexercising etc. But you're not your ED. Yes, it may control you and takes over your life but underneath all the ED thoughts, lying, self hate etc. is a wonderful human being. And some people are more prone to having an illness. Sometimes it has to do with genes, sometimes its because theres pressure to be thin (athletes, dancers, celebrities can be at a higher risk of developing an ED). I also read somewhere that if one's sibling or (any close person really) had/has an ED then they are at a higher risk of developing one too. This is the way I see it. One day I didn't wake up and be like "Hey I think im going to starve myself today and lose X amount of pounds!" It took time to develop. Looking back I can see when I started to cut back on certain things, feel weird if I didn't exercise or even think that having one extra piece of cereal would make me gain weight, all gradually happening without me knowing what I was doing. I also realize that some of the things that I did to avoid calories were ridiculous. Even though I still have a lot of thoughts about whether or not this one food will make me gain weight, I know better, even if part of me doesn't. When I was at my lowest I didn't. Some of the things that people do when they have eating disorders are just so incredibly crazy or extreme and make you really wonder "Did I really go that far and do that". An eating disorder is not a choice. Its a consequence of a whole bunch of other factors. Its only when we go through the difficulty of recovery and CHOOSING to eat and become healthy that we can realize how deep into anorexia we were.